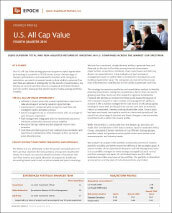 U.S. All Cap Value - Epoch Investment Partners, Inc.
Our U.S. All Cap Value strategy pursues long-term capital appreciation by investing in a portfolio of 50-60 stocks across a broad range of market capitalizations. As fundamental investors with a long-term orientation, we select companies based on their ability to generate free cash flow and allocate it intelligently for the benefit of shareholders. Our bottom-up security selection process is balanced with diversification and risk control measures that should result in below-average portfolio volatility.